Go to Demand-Based Parking Meter Rate Setting. Go to Parking Authority Blog to learn more. 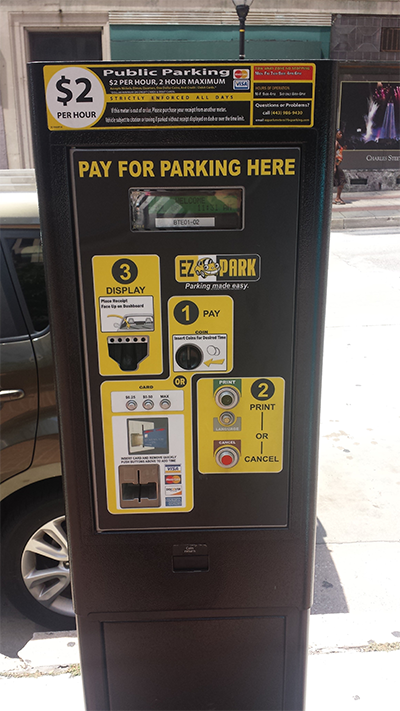 Since 2004, hundreds of EZ Park Parking Meters have been installed throughout Baltimore City, replacing thousands of single space parking meters. Problems with EZ Park Meters can be reported using our online form below or by calling (443) 986-9430 for 24/7 customer service. But not every single space parking meter can be replaced with a multi-space EZ Park Meter. Some blocks have just two or three meters or there isn't enough curb space to place an EZ Park Meter. 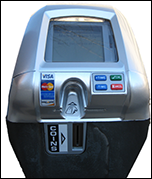 Early in 2014, hundreds of new single-space parking meters that accept credit cards, as well as coins, replaced many of the old parking meters throughout Baltimore. Now, drivers can park in these areas with the same ease and convenience they have grown to enjoy since the debut of EZ Park Meters in 2004. Problems with single-space meters can be reported by calling (410) 396-1881. Project SPACE launched in Phase 1 of Baltimore City on July 10, 2014. We continue to add more areas to Project SPACE. Go to www.morespace4all.com to find the most current information. There you will find maps of the areas where this program is in effect. Station North and Midtown will launch July 23, 2018. Reserves on-street parking spaces for people with disabilities in metered areas. Retrofits existing multi-space EZ Park meters to meet most current Americans with Disabilities Act (ADA) standards. Requires payment from everyone parking at ADA accessible meters. Please click here to learn more about Project SPACE. If your disability tag/plate is displayed and you are parking outside of Phase 1, 2, 3, 4 and 5 boundaries, you are entitled to park at an on-street parking meter for double the meter duration limit (not to exceed four hours) without payment. Example: if the parking meter’s duration limit is one hour, you may park for two hours; if the meter duration limit is two hours, you may park for four hours; if the meter duration limit is four hours, you may only park for four hours. We do not issue parking tickets nor do we adjudicate them. Please call the Bureau of Treasury Management/Collections at (410) 396-4080. We do not issue parking tickets nor do we collect parking ticket fines. Please call the Bureau of Treasury Management/Collections at (410) 396-4080.